Paris had her farrier visit today. We pulled Paris’ shoes and are going to try her barefoot over the rest of the winter. Once she is jumping and working more, her shoes will go back on. The ground was about half unfrozen so I worked her outdoors- hooray! I longed her to let her get the feel for the arena with no shoes, see how she was moving, and let her burn off a little playful energy. 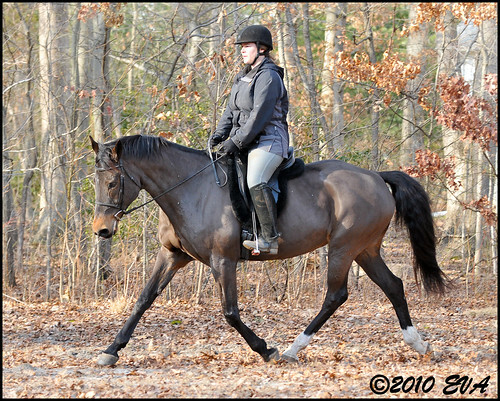 She moved out beautifully- as I expected, she was a little tentative on the firmer parts of the arena and was perfect on the unfrozen ground. I kept my riding concentrated to the softer areas of the ring. Our ride was short and sweet… very sweet! I rode for about 25 minutes at the walk and trot on a large oval. I’m pretty sure Paris is the nicest horse I’ve ever ridden (of course, Alibar was the BEST horse I ever rode but I cannot deny how classy and wonderful Paris is). Paris’ natural balance is an awesome thing to witness. She is strong as an ox and I can feel a tremendous push when I ask for transitions. Although Paris is in the midst of cycling, she was very responsive to the aids. After over a month out of the saddle (how awful! never again!! ), my riding was weak at best but Paris made me look good. I was really pleased with the photos my mom took. What a nice mare!